If it is a mega-compact single-serve home espresso machine you are searching for, one which not only makes flawless espresso but also provides a bean-to-cup feature in an incredibly compact design, consider the Jura Ena 1, one of the most compact/small machines available. Other great features include an auto energy conservation mode, as well as aroma preservation to keep whole beans in the machine fresher for an extended period of time, and extra value if you are an Amazon Prime Member. Programming options include the ability to program amount of water per shot, amount of coffee per shot, aroma levels, active monitoring of coffee beans to let you know when more will need to be added, and a drip tray that is monitored. Although this machine also has as another feature an automatic shut-off function, it has no option for programming auto-on at a particular time. This machine is very simple to use, and requires the user to simply add water and whole coffee beans or pre-ground espresso. This machine basically makes just espresso only, and it does not, by itself, make beverages that require milk froth. You could consider, however, investing in a separate milk-frothing appliance to use independently of the machine, which would allow you to create beverages such as cappuccinos and lattes. Also important to note is that this machine does not have an independent hot-water dispenser, so beverages requiring a hot-water dispenser, such as tea, cannot be made with this machine. This espresso maker allows for using a cup up to 5-1/2 inches tall. Does This Machine Use Pods, Grounds, or Both? This machine has the ability to utilize either whole coffee beans or pre-ground coffee — your choice on a day-to-day basis. If it is beans you want to use, these can be poured into a bean hopper built into the machine. On the other hand, if it is grounds you wish to use on any given day, there is a bypass doser with this machine into which you can pour pre-ground coffee. Built-In Coffee Bean Grinder Info. Yes, this machine does have a built-in “Aroma+” coffee bean grinder that gently grinds whole coffee beans inside the machine just prior to brewing. 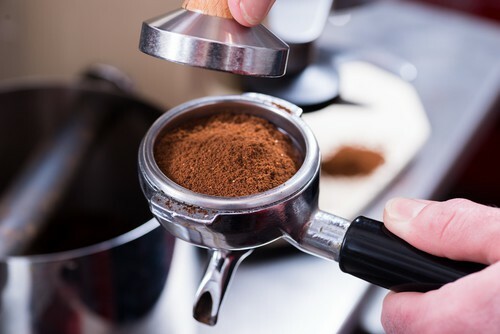 With most built-in grinders on espresso machines, customers have commented that on the machines other than the Jura, the grinders tend to get “gummed up” with the oilier coffee beans. This is not the case with the Jura Ena 1, other than sugar-coated beans, which do tend to become gummed up in the grinder and it is recommended that these types of “treated” beans not be used. The bean hopper in this machine holds 4.4 ounces. This machine has no milk-frothing capability. There are, however, stand-alone milk frothing pitchers available that operate separately from the machine. Brew time length is approximately 20 to 30 seconds, which includes the time it takes to grind the coffee beans and dispense the espresso. This machine has no “double shot” function or setting, although a simple press of the single shot espresso button twice allows for making a double shot. This machine does not have a cup warmer. This machine is available in a combination of black and silver only. This machine is housed in plastic. This Jura heats water via a Thermoblock patented system. This machine has a Thermoblock heating system to heat the water. This machine is noted for being very quiet. Even the built-in grinder has been noted to produce a very low noise level. The water reservoir on this machine holds approximately 37 ounces of water. When filled, this size of water tank will allow for brewing five 6-ounce cups of espresso before needing a water refill. This machine, because of its built-in grinder and bean-to-cup capability, makes no to very little mess that needs to be cleaned up. In addition, the cleaning and rinsing cycles on this machine are very vigorous, and allow for a very thorough cleaning. Despite its compact size, this machine is very sturdily built at 19.4 pounds. 9.1 (H) x 17.5 W x 12.7 D inches. This machine has a two-year warranty through Jura. This machine utilizes 1450 watts. Very compact home espresso machine for those of you who don’t have a ton of counter space. Bean-to-cup technology, which allows for the freshest possible end result. Incredible ease of use, even for a beginner. A cleaning cycle that is much more rigorous than many available machines. Even though this machine is a very small machine that won’t take up much counter space, it still weighs in at approximately 19 pounds, which doesn’t make it the easiest machine to maneuver. No milk frothing capability. A separate milk frothing appliance would need to be purchased if milk-froth-based beverages are on your list as must-haves.